Photo: Mr. Richard Vlaha Senior plays the violin (the one n the search) with his great grandson, TJ Dumser, on another violin. (Photo credit: ©1989 Mr. Richard Vlaha Jr.). We are seeking your help in finding a sentimental violin that once belonged to a Bethel family. Music is a world in and of itself, whose magic touches the heart and reaches across the world in sound. Voice is one way, but it also happens through man-made instruments whose sound becomes sweeter as the instrument ages through the years. Anyone involved in the music world can also identify with the passion that comes with an attachment to an instrument that you or someone you love might have cherished in the early days of learning to play. This is the case with former Bethel residents Mr. and Mrs. Richard Vlaha, who lived in Bethel in the 1990’s, and who are now searching for a violin once owned by Mr. Vlaha’s father, the late Richard Vlaha Senior (“Great Gramps”). Richard Vlaha Senior was originally given the violin by his brother-in-law, the late Ed Garner. Both Ed Gardner and Richard Vlaha Senior were from Berwyn, Illinois. When Richard Vlaha Senior died, his son Richard Vlaha inherited the violin. They do not know the brand of the violin but said it was a full size (4/4) adult violin, shiny brown in color, and in good shape. (Also view photos and video below.) The violin was originally stored in a black case in the shape of a violin, Mr. Vlaha Jr. said, and the case was pretty worn. 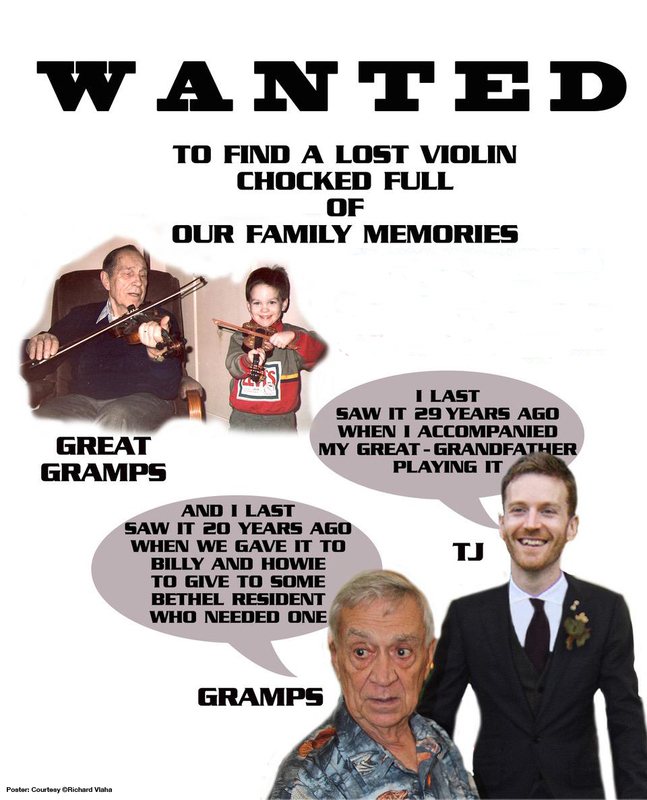 The Vlaha’s would like to find the violin and give it to their grandson, TJ Dumser, who is now an accomplished musician. Little did the Vlaha’s know that 20 years after they gave the violin away in the 1990’s, their grandson would become proficient in the music world, and now their search continues, to bring that violin back to him for sentimental reasons. TJ Dumser, who is from Astoria, New York, is a Senior Sound Designer in the New York City location of music and sound studio Nylon Studios, who also have offices in Sydney and Melbourne. Dumser has more than a decade of experience in audio post production, working across commercials, TV, film and radio. He has worked on projects for such clients as Budweiser, NHL, Sunoco, LG, Dom Perignon, Michael Kors, Jeep, Sabra and March for Our Lives. Dumser has lent his talents to a wide range of award-winning spots that have taken home Cannes Lions, Clios, Webby Awards, and Telly Awards. View Dumser work here and music here and awards here. The Vlaha’s had the violin in a closet for many years and then in 1998 decided that the violin could be put to better use. The Vlaha’s are friends of Billy Michael, a well-known musician in Bethel, so in 1998 they gave the violin to Michael. “I remember handing it to Billy in his vegetable garden,” Mr.Vlaha specifically recalls. He trusted that Michael would be able to find a recipient for the violin. Michael remembers giving the violin to performing musician Howie Bujese (with the approval of the Vlahas). Bujese refurbished violins and also played musical performances locally. Michael said he specifically remembers handing the violin to Bujese at one of the local Fiddle Festivals they’ve participated in together numerous times through the years. We interviewed Mr. Howie Bujese and he said he had no recollection of the violin, but admits his memory might not be the best. This is as far as the story goes for now. If you or your child or someone you know received or purchased a violin similar to the one pictured, anytime between the late 1990’s and present, or you know of any additional information that may lead to the violin discovery, please contact Bethel Advocate at betheladvocate@aol.com and we will pass your information on to the Vlaha family. The Vlaha’s, who now live in another state, said they will replace the violin with a similar-value violin, for the person who has the violin for which they are searching. The people we spoke to did not think the violin had any high value, the Vlaha’s just want to find it for sentimental reasons, as previously mentioned above. View more photos (from 1989) of the violin and a family video of Richard Vlaha Senior playing Happy Birthday on the violin at a family event, below. 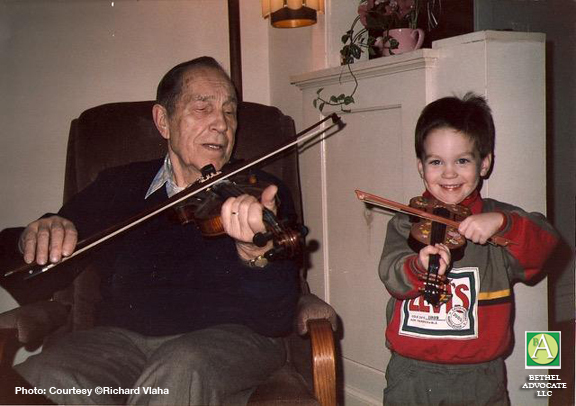 One photo shows Mr. Vlaha’s father playing the violin with his great grandson (on a different smaller violin). The search is for the violin Mr. Vlaha Senior is holding. The Vlaha’s also made a poster for the search. 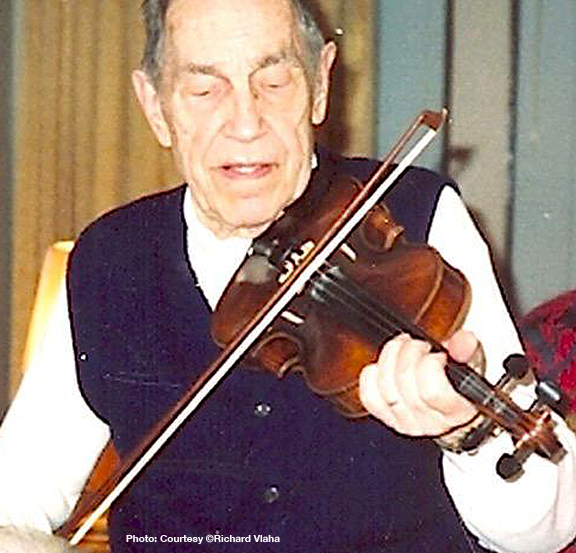 CLICK HERE to view Mr.Vlaha Senior playing the violin at a family event years ago. EDITOR NOTE: There was a story about a stolen Stradivarius violin in the 1990’s, however, the violin in this search is NOT that violin. That violin is presently in the hands of its new owner after he purchased it from an insurance company who was handling that case and eventually put the violin up for sale. The Vlaha’s unfortunately do not know the brand of the violin in their search, but as you can see in the photo it does have some identifiable markings. Read that story in People here and in the News Times here.